In what future generations will likely see as a major, potentially catastrophic blunder of monetary policy, the West and particularly the City of London continues to hemorrhage huge volumes of gold which is flowing Eastwards to Singapore, India and China from London via Switzerland. 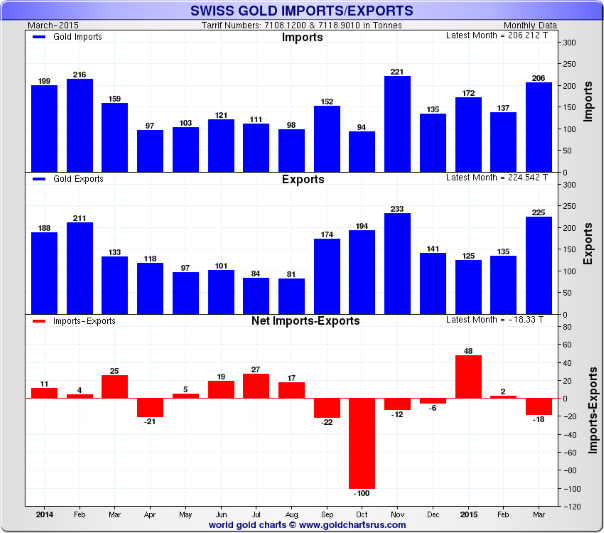 “Gold exports to China from the refining hub of Switzerland almost doubled to 46.4 metric tons in March”, up from 23.6 tonnes in February” according to Bloomberg. India’s gold imports from Switzerland doubled to 72.5 tonnes in the same period. The increasingly affluent masses in China and India continue to have a voracious appetite for gold as a store of value. Policy makers in China and Russia have also made gold a cornerstone of their monetary policy. 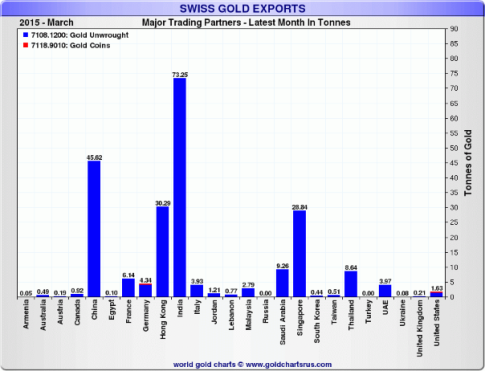 The Asian demand for Swiss refined gold was met in part by very large gold imports from the U.K. Bloomberg states that Swiss imports from the U.K. rose sixfold in the same period to 97.2 tonnes. This figure dwarfs Swiss imports from other nations. 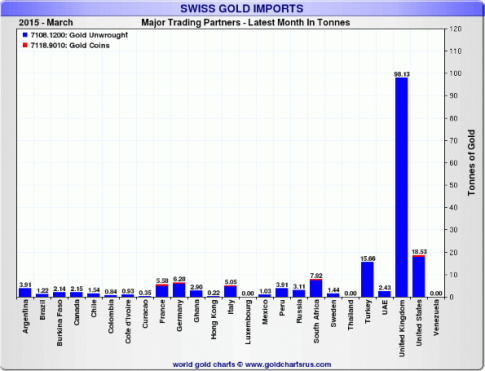 The U.S. and Turkey exported just over 18 tonnes and 15 tonnes respectively and these figures greatly exceed the amounts coming from all the other countries from whom Switzerland imports gold. It is likely that London good delivery bars (400 troy ounces) favoured by western institutions including bullion banks and central banks are being imported into Switzerland. They go to the Swiss refineries to be smelted and refined into kilobar format which is increasingly popular in Asia and traded on the Shanghai Gold Exchange (SGE). Bloomberg also reports that “Global sales from gold-backed funds totaled 55.7 tons in March.” This would indicate that the gold making its way to Asia is coming from official holdings and or liquidation of gold ETFs. Some of those selling the ETFs are opting to acquire physical, allocated bullion and storing in vaults in Zurich, Hong Kong and of course Singapore. Singapore is fast becoming an important gold hub and a favourite location for allocated bullion storage among risk conscious bullion buyers. Hong Kong saw a decline in its share of the market as Chinese investors increasingly opt to use the Shanghai Gold Exchange (SGE) for buying and trading in general. The SGE deals solely in physical gold bars and not paper contracts or unallocated bullion bank accounts which can be used to divert and reduce actual demand for physical gold and cap gold prices. 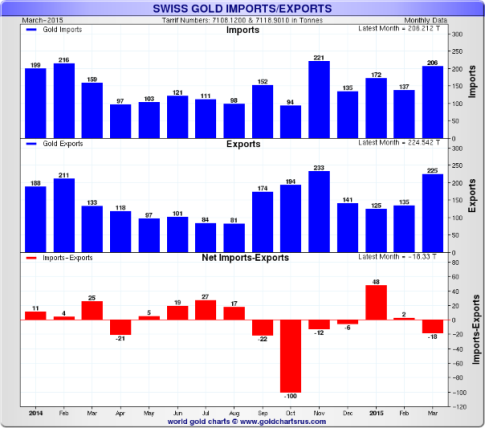 Between them China and India and Singapore – who imported almost 29 tonnes from Switzerland – imported almost 150 tonnes of the 223.3 tonne total of gold exported from Switzerland in March which Bloomberg said are “the highest since at least 2013”. While sentiment towards gold in the West is abysmal – even as gold languishes at record lows when adjusted for inflation – Asian demand remains insatiable. It would be wise for investors to inform themselves as to why this should be so. Demand for gold in Asia is often written off by Westerners as an irrational impulse of uneducated Asian peasant farmers and workers. This is unfair to gold buyers in Asia – many of whom have experience of currency devaluation and therefore opt to own gold as a savings mechanism and a superior store of value. However irrational holding gold may appear, the alternative – holding paper currencies which are continually being devalued through QE and inflation in various sectors of the economy – is even more irrational. The fact that it is a matter of Chinese state policy to continuously accumulate vast volumes of gold and that the Chinese government has encouraged its citizens to own gold shows that bullion is not the fringe asset of irrational ‘gold bugs’ as it is often suggested in some western media. The fact that Western central banks continue to hold, consolidate and repatriate gold shows the strategic importance placed on gold by the very entities who issue the currencies we use. People need to protect themselves from potential economic and monetary crises where existing currencies may be devalued. In the event of serious problems or even the collapse of the unsustainable debt-based international monetary system, an allocation to gold will protect wealth. Both the savings of peasants in India and those of the middle classes and high net worths in the western world. Separately, this morning the LBMA have said that gold bullion trading in London isn’t likely to move to an exchange because it would increase costs and reduce liquidity, the LBMA told Bloomberg. The London Bullion Market Association on Monday said it has commissioned Ernst & Young LLP to conduct a study and prepare recommendations on how to develop the market. In the future, there may be more regular transaction reporting and a return of publishing gold forward offered rates and the forward curve, said Ruth Crowell, the association’s chief executive. The World Gold Council began gathering views from banks and traders, including potentially moving over-the-counter trading to an exchange, three people with knowledge of the matter said in February. Contracts change hands through an exchange in New York, Singapore and Shanghai, while London relies on banks and other companies to manage counterparty risks.